Installed Custom File Back Indexes in the folder of your choice. Order folder and give specs for indexes: choose your titles, colors and positions for flip up or book style. Ancom will contact you with a quote. 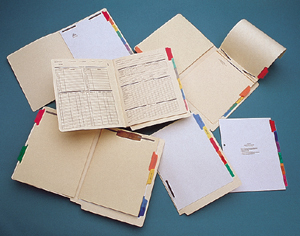 The hinged flap on file back indexes allows access to different sections of the folder with out removing other documents. Save valuable time, decrease errors, refine practice communication, enhance professional image and increase practice profits with custom file backs. WE DO IT YOUR WAY! You choose the number of tabs, section headings, paper stock & color, hole punch position, sequence position and color of tabs. Ancom will offer tab suggestions based on specialty. For additional information and quotes contact us via e-mail-phone or fax. Send us a sample of your current index for a no obligation quote. Ancom has very competitive prices on custom indexes and file backs.For more information on this product call 800-845-9010 or email request@ancom-filing.com.